The right-hand page has the illumination, which is framed inside a gilt rectangle. 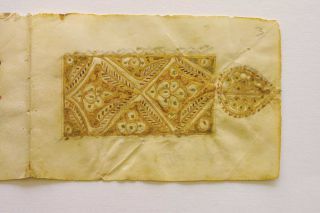 The central decoration has two concave diamond shapes with a gilt background marked with brown lines framing stylised multi-lobed fleurons. The decoration is surrounded on each side by six triangles containing similar floral motifs. The whole illumination is separated by strips on a white background dotted with brown markings and divided by gilt segments. The left-hand page contains black kufic script. Vowels are marked by red dots and the hamza is shown with a green dot, as in the Abi al-Aswad system. The end of the verse is indicated by a triangle of three gilt dots. The end of the fifth verse is marked by a gilt medallion. 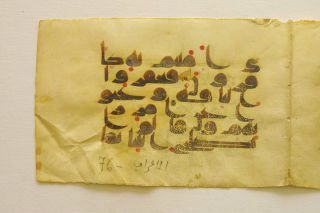 The title of the sura, with the number of its verses, is indicated on the same line by a gilt kufic inscription with brown edges which terminates in a palm-leaf motif pointing towards the left-hand margin. The illumination, in a gold rectangular frame on the right-hand page, has two concave lozenges in its centre, gilded at the bottom and peppered with brown lines. The left-hand page is written in black kufic script with the title of the sura and the number of verses given in golden kufic script. 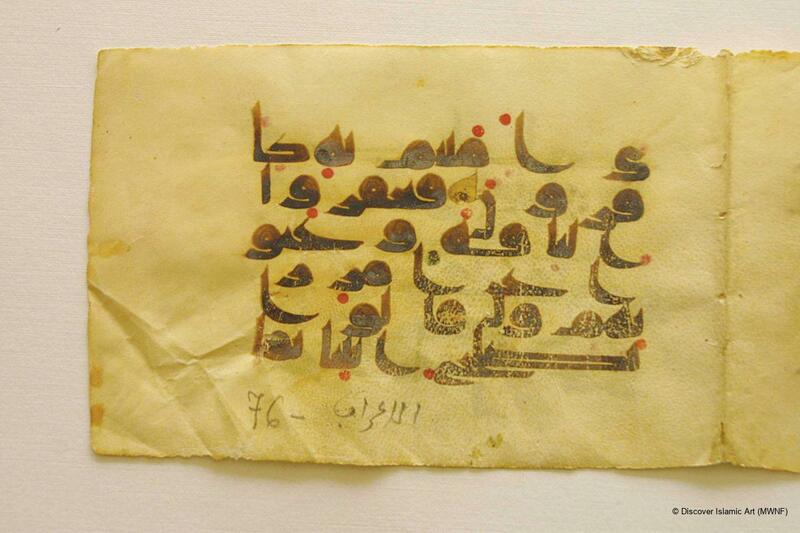 The colophon of the Qur'an includes the Act of Mortmain (Tahbis) dated 295 / 907. After the abolition of the habus foundation in Tunisia, the National Library obtained this Qur'an in 1967. 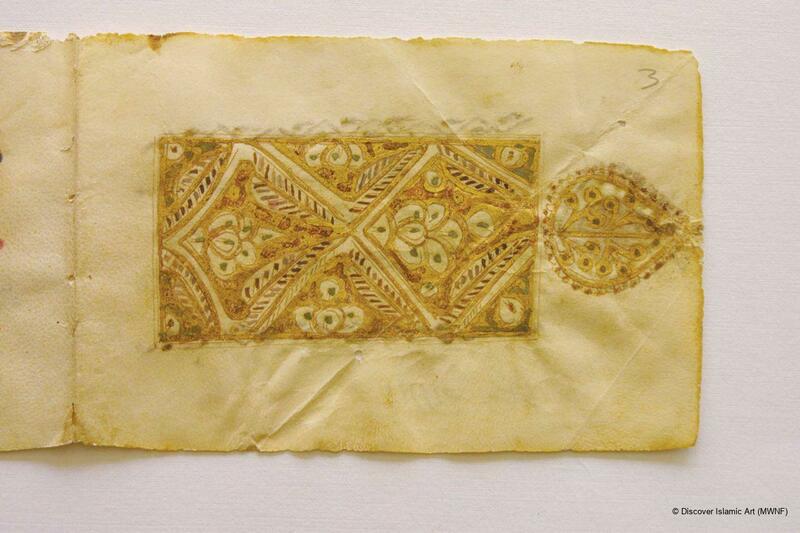 In 1983 it went back to Kairouan, to the Centre of the Islamic Arts and Civilisation of Raqqada. It has been displayed at the Raqqada Museum of Islamic Art since 1986. 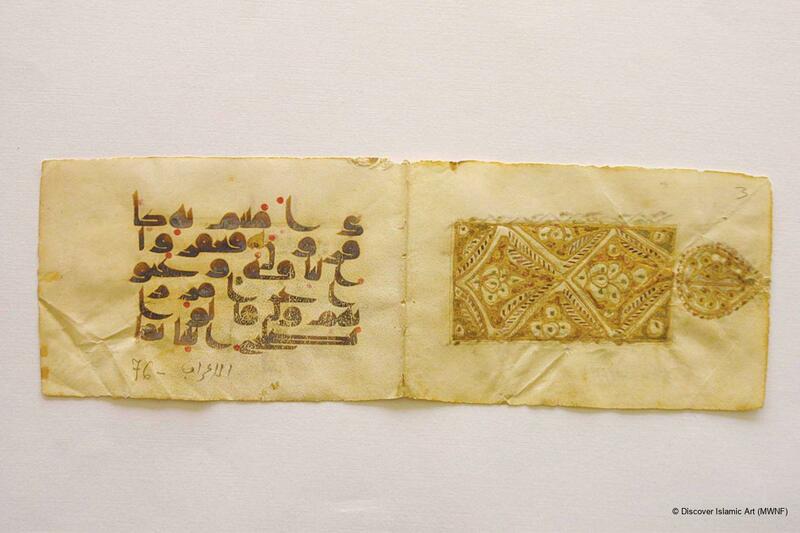 This Qur'an was copied and left to the Great Mosque of Kairouan by a woman who appears to be Kairouanese. It was probably copied in Kairouan itself which was a great centre of book production at the time. Ifriqiya: Thirteen Centuries of Art and Architecture in Tunisia, pp.175–6.